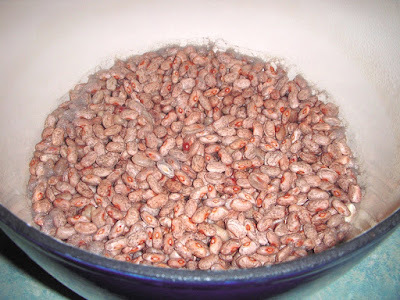 Last fall, while cooking a pot of dried pinto beans for supper, I started thinking about how I could turn pinto beans into refried beans. Surely, it couldn't be that hard. I started by looking at refried bean recipes in cookbooks and on the Internet. Sure enough, it wasn't hard to transform pinto beans into refried beans. Finding the right blend of spices, however, wasn't as easy. I ended up creating my own recipe using my mother's method of cooking pinto beans, a combination of spices culled from several recipes and topping it off with some shredded cheese. 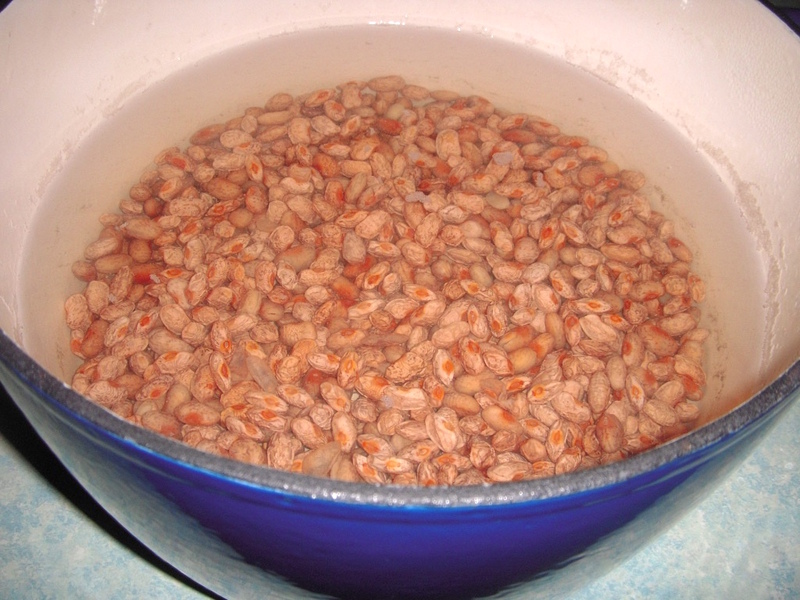 The first thing to remember about dried pinto beans is that they double in size when cooked. I found this out in my late teens when my mother asked if I would pick up a package of pinto beans for her at the grocery. This was the first time I ever bought dried pinto beans and I bought a 32 ounce package because the 16 ounce package didn't look big enough. As it turns out, a 16 ounce package will yield approximately 6 cups of beans when cooked. Working in batches, spread some beans out on a work surface. Sort through the beans, discarding any that don't look good and removing any debris such as small rocks. Put the beans in a colander and rinse them under cold running water. 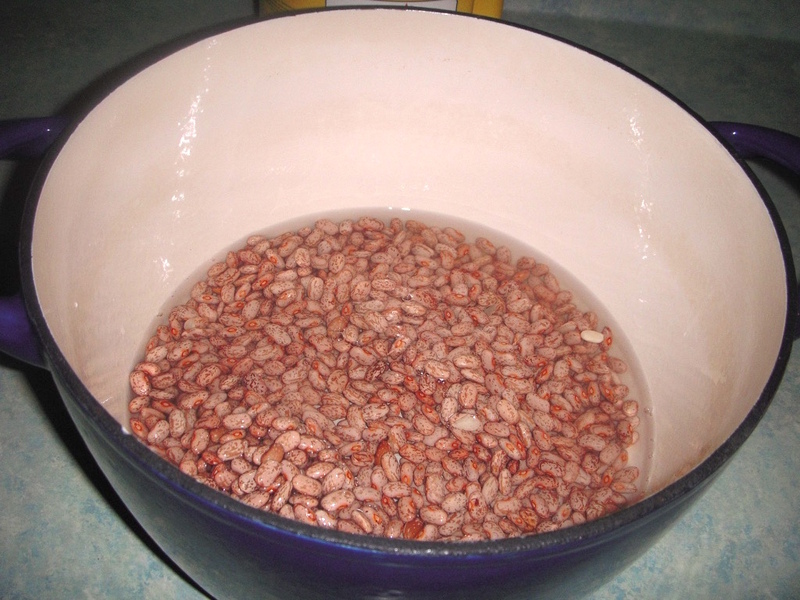 Dried pinto beans need to be rehydrated before they're cooked. This is usually done in one of two ways. Either cover the beans with cold water and let them sit at room temperature for several hours or bring the beans to a boil, remove them from the heat and let them soak for 1 1/2 hours. My mother used a different method. I don't know who taught her to cook pinto beans this way, but the method is faster and the beans turn out tender and delicious every single time. This is how my mother taught me to cook dried pinto beans. Once the beans have been rinsed, put them in a large pot -- remember they'll double in size -- and barely cover them with cold water. Bring the water to a boil and let boil for two minutes. Drain the beans in a colander, put them back in the pot and generously cover the beans with cold water. Bring the beans to a boil and add sugar, Crisco -- I assume my mother added this to help tenderize the beans -- and the spices for refried beans: chili powder, cumin, garlic powder and onion powder. Do not add salt. Salt added at the beginning of the cooking time will make the beans tough. Reduce the heat to medium-low, cover the pot with a lid and cook for two hours or until tender. The water will cook down so check the pot periodically and add additional water if needed. When the beans are done, stir in the salt. Remove the beans from the pot with a slotted spoon, reserving the cooking liquid. If you want the beans to have a smooth consistency, mash them with an electric mixer, adding 1/2 cup cooking liquid for a creamy consistency. If you want the beans to have more texture, mash them with a fork, adding 1/4 cup cooking liquid at a time, until the beans reach the desired consistency. Normally, this is where you'd put the beans in a skillet with lard and turn them into refried beans. Not with this recipe. I omit this step which is what makes them "unfried" refried beans. Put the beans in a microwave-safe serving dish and heat for three minutes. Stir and heat another three minutes. Sprinkle shredded Colby Monterey Jack cheese on top and heat in the microwave until the cheese melts. If you don't want refried beans, leave the beans whole and serve them as a side dish or even as an entree for a meatless meal. The addition of chili powder, cumin, garlic powder and onion powder turns everyday pinto beans from ho hum to olé! Sort beans, removing any that don't look good as well as any other debris such as rocks. Put beans in a colander and rinse them with cold running water. Put the beans in a large pot and barely cover them with water. Bring the water to a boil. Boil 2 minutes; drain. Generously cover beans with water and bring to a boil. Add sugar, Crisco, chili powder, cumin, garlic powder and onion powder. Reduce heat to medium-low; cover and cook 2 hours or until tender. Check periodically during the cooking time and add additional water if necessary. When the beans are done, stir in the salt. Remove the beans from the pot with a slotted spoon, reserving the cooking liquid. If you want the beans to have a smooth consistency, mash them with an electric mixer, adding 1/2 cup cooking liquid for a creamy consistency. For chunkier beans, mash the beans with a fork, adding 1/4 cup cooking liquid at a time, until the beans reach the desired consistency. Put the beans in a microwave-safe serving dish and heat for three minutes. Stir and heat another three minutes. Sprinkle the desired amount of shredded Colby Monterey Jack cheese on top and heat in the microwave until the cheese melts.